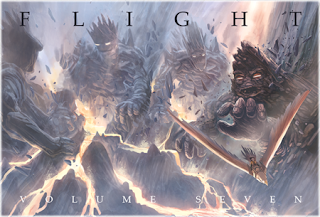 Picked up Volume 7 of the Flight anthology today, it was released recently at Comic-con and for me is an essential annual purchase. if you haven't seen these collections before now is a great time to start. Flight is an annual collection of strips created by comic artists, brought together by editor Kazu Kibuishi. Whereas usually the artists often work with writers and on contract jobs, these are strips they do almost entirely on their own. The appeal of the stories may be a touch subjective given the broad range of styles, topics and themes on offer, but they are always stylish, worth reading, and there are usually several gems in each collection. I can almost recommend these anthologies just for the wonderful annual opener provided by the awesome Michel Gagne, but that would be doing a disservice to the wealth of talent on show. You can check out a preview right here, and if you have even the slightest of interest in comic art you owe it to yourself to check it out! Simply majestic anthologies. This years edition isn't quite up to the standards of three and six (in my humble opinion anyway) but I did love the way Gagne played with his previous efforts in this years addition. Thumbs up here too.